Are you sure that wasn’t an Kool-Aid you were drinking this morning? The difficulty with tearing down old buildings is that it takes 116 years to build another one. 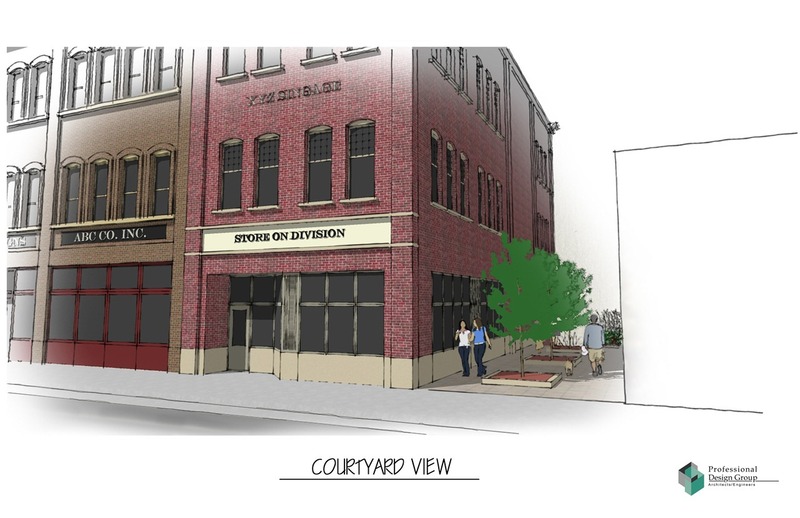 One really doesn’t want to make the kind of hasty decision that leads to its replacement by a still-young-but-rapidly-being-ushered-to-the-chopping-block building like the Community Resource Bank. If Jerry owns the building, and is looking to do this thing without any public assistance whatsoever, then there may not be much that anyone else has to say about the matter (stipulating that I haven’t seen what kind of historic preservation rules we have around here). Also, if the Aldsworth building really is dilapidated and beyond repair, then its fate may truly be inevitable. However, if the city has any real input on this process on a regulatory level – and particularly if the city is expected to provide financial assistance for this project – then we should think very carefully about this new project before giving our town square a modern facelift. The Aldsworth Building seemed relatively intact on my last visit to Scott Davis’s studio,* and it would be quite foolish to trust the assessment of this building by the very people who want to see it destroyed. * That is the building in question, yes? – I haven’t had a chance to confirm that since this came up. Looking at the aerial shots you have submitted from the developers, I am struck by how little the destruction of the Aldsworth Building would contribute to the footprint of the new structure. This would seem to suggest that the project could still be viable if the new development was limited to the Community Resource Building site and its parking lot. 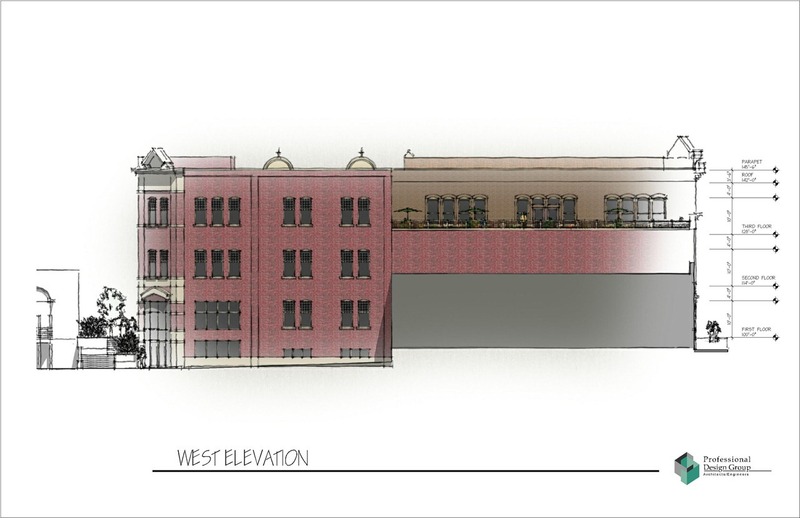 The HPC has to approve these plans and will look at them for the first time on November 19th. Any construction that is done in the Historic District of Downtown has to be in line with the Secretary of the Interior’s Standards f or historic preservation. I am not an expert on the standards and what happens if the city does not follow them, but if they are not followed that might jeopardize the district’s designation of a Nationally Registered District. From what I am told the Aldsworth Building is in the district and must follow those guidelines. Hayes: What are the advantages to being being a Nationally Registered District? David: IMO not much and potentially alot of trouble. 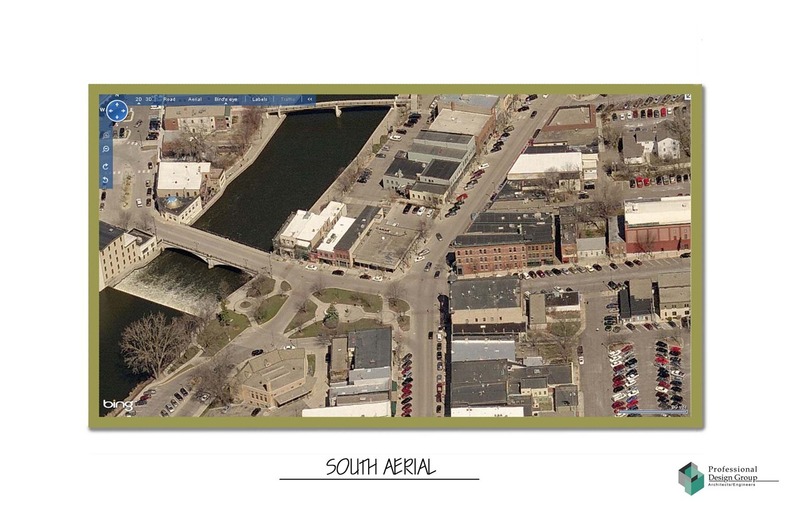 A KYMN tweet links to a KYMN blog post with audio: Jerry Anderson discusses 25 Bridge Square project. I’m looking forward to attending the HPC meeting to hearing all the pros and cons. David, Off the top of my head, we are able to apply for certain grants and tax credits. It also sends a pretty strong message that we are committed to persevering our history. Here is a short list from the National Park Service. Linda Mack’s column in today’s Strib is somewhat relevant to this conversation. Here is a link to Linda’s article. This is becoming the trend. “Bridge Square Boondoggle Would Bail Out Local Developers” is sardonic, not sarcastic, and might have made a better headline. I’m not that upset about the Aldsworth. It’s a small, apparently unimportant building, and doesn’t seem architecturally unique for the downtown. 25 Bridge Square, however, is unique to that area and IMO should be preserved. Historic preservation ought to be about more than just the number of decades the building has been sitting there (though four decades is not insignificant). However, it seems few if any agree with me about 25 Bridge Square. If it has to go, the developer should not bend over backwards to accomodate a building that’s less worthy of preservation. Sean – I’m glad you spoke up about 25 bridge square. While the Community Bank Building may not be the most distinguished example of its type, I have no objection to it. In fact, I enjoy seeing varied architectural styles around a square. One of my favorites is Rice Park in St. Paul. There, the Ordway, the St. Paul Building (maybe it has another name now). the Landmark Center, the St. Paul Hotel and the public library are arrayed, each representing a different style period. What’s the historical significance of the Aldsworth Building? The current 1965 bank building undermines both principles. The historic significance of the Aldsworth building is simply that it has been part of the visual fabric of Bridge Square for the majority of this city’s existence. If it is not worth preserving that bit of our history, why should be bother preserving any of the other storefronts downtown? OTOH, the Community Resource Bank is a sore thumb which clashes with most everything around it. It has about 35% of the history of the other buildings downtown, so it would be about 65% easier to let it go. Patrick, wouldn’t the historical “visual fabric” be maintained and hugely enhanced with this project? Not if it includes the Aldritch Building, no. McOld can never hold a candle to actual old. I have an aesthetic comment to interject about the present Community Bank building. 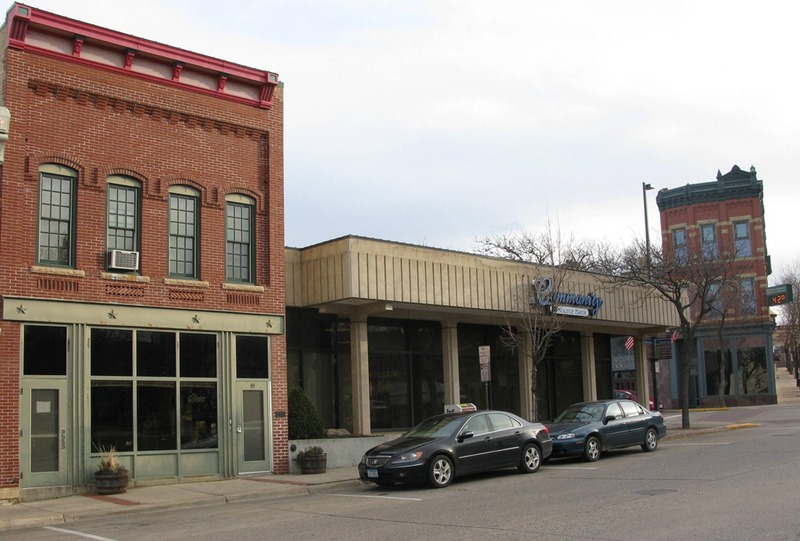 I still remember the first time I came to downtown Northfield in 1977 and the one lasting impression I had was seeing that the tragedy of urban renewal had reached this small town. The building stuck out like a sore thumb and all I could think of was that a pretty town on a river had been mutilated. As an artist and teacher I understand that modern and old can and do co-exist but that particular building was a terrible fit for the space and I have hoped for years that someone would do the right thing and tear it down. I hope the city can see fit to approve the new development. It isn’t perfect but really anything-well, I will have to qualify that-ALMOST anything will be a visual improvement. It’s the fact that the current 25 Bridge Square leaves such a “lasting impression” that I think more consideration should be given to its preservation. It’s a very ugly building, I won’t deny that. There are several things the proposed building does better — like having a riverside entrance and eliminating the surface lot. But it’s undeniably less historic. Regarding the “tragedy” that allowed for the construction of 25 Bridge Square — I can’t get over the feeling that we’re just repeating the same thing. We have a building that’s been there for decades, and we’re tearing it down because it’s no longer in vogue and we think we can do better today. How can we possibly be atoning for this 70s crime by repeating it? With that catchy slogan, historic preservation has staked out its place in today’s most dynamic design movement — the search for sustainability. Patrick, this article was referenced above by Hayes (#8). It makes good points, but — not to beat a dead horse here — they apply much more strongly to 25 Bridge Square than Aldsworth. There is simply more material (more embodied energy) in that Community Bank building than there is in the much-smaller Aldsworth. It’s also worth considering that, while it may generally be environmentally beneficial to preserve what’s already there, there have to be exceptions. If there are major structural issues that would require a lot of material and/or labor, it may simply be better to start fresh. I’m not advocating for the destruction of either building. I have lived most of my adult life in older historic buildings and have a great appreciation for them. However, I doubt the “green” argument has any validity to it. Especially in a major downtown location like the one being discussed. I would view that building as more a “bolt” in the larger Northfield machine. Changing that bolt will have little impact on the overarching energy profile of Northfield. Except that by not allowing the increased usage density of a new building – additional building is then forced farther out to the perimeter created less effective energy use patterns. How do you feel about the proposals that the city help fund this new development that Ray Cox and Jerry Anderson want to build? I have always thought the Community National Bank building was less then desirable. I do not agree with the argument that we should keep a building just because it has been there for 40 years. In my opinion it does not fit the fabric of the downtown. I mean really would you bring back bell bottoms and disco? As for the Aldsworth building, in principle it would be good to be saved but in reality it may benefit the area more if it is gone. If the developers can open up there area behind the buildings and incorporate and enhance the riverfront, in my mind would justify the removal of the Aldsworth. Patrick, I did not see the details (or even a reference) to what is being asked from the city. 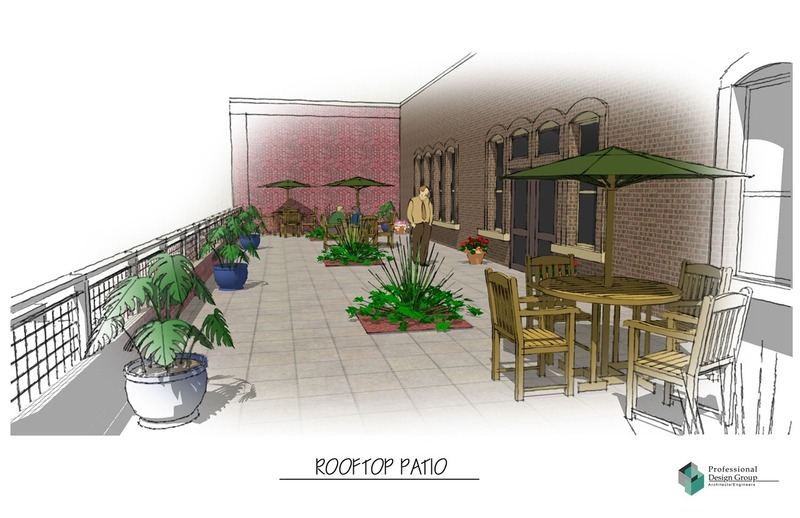 In general, I think the new building would benefit Northfield. It is Staff’s belief that the demolition of the 1966 bank building is appropriate since the building is a non-contributing property in the historic district. For the 1893 Aldsworth building, it could be argued that, as noted in the HPC’s 1982 design guidelines book, the Aldsworth building even then was modernized to a different aesthetic from the building’s construction in 1893. In 1996, the façade of the building was again altered from its original historic appearance, which further compromised its historical integrity. The Aldsworth building is also not a freestanding structure, but has been fully integrated into the 1966 Community Resources Bank. Since the two buildings have been consolidated into one building, it would be difficult to separate one building from another in the demolition process. 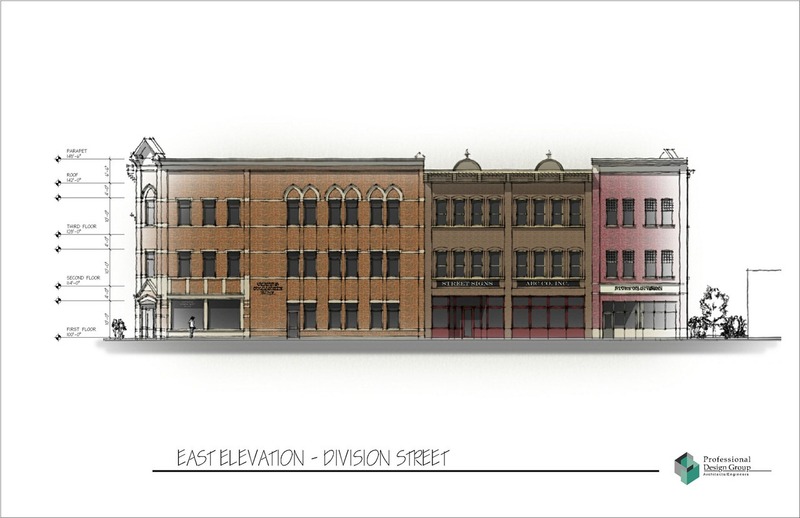 In addition, this integration means that its historic integrity as a separate building has been compromised. 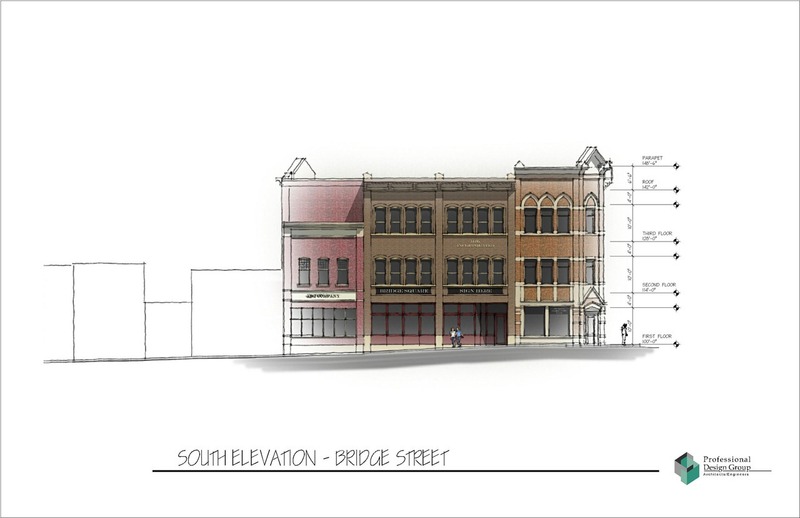 Moreover, the demolition of the Aldsworth building will lead to the construction of a new building at 25 Bridge Square that will be more compatible with the downtown’s historic building than the 1966 bank building currently is. Therefore, Staff recommends that the Aldsworth building also be demolished. Developer Jerry Anderson will be a guest on our radio show/podcast today. Perhaps Hayes, or some amateur local historian, could let us know which buildings in our town would actually meet this criteria for bothering to preserve? Off the top of my head, the Community Resource Bank might be one of the very few that still maintains its original appearance. 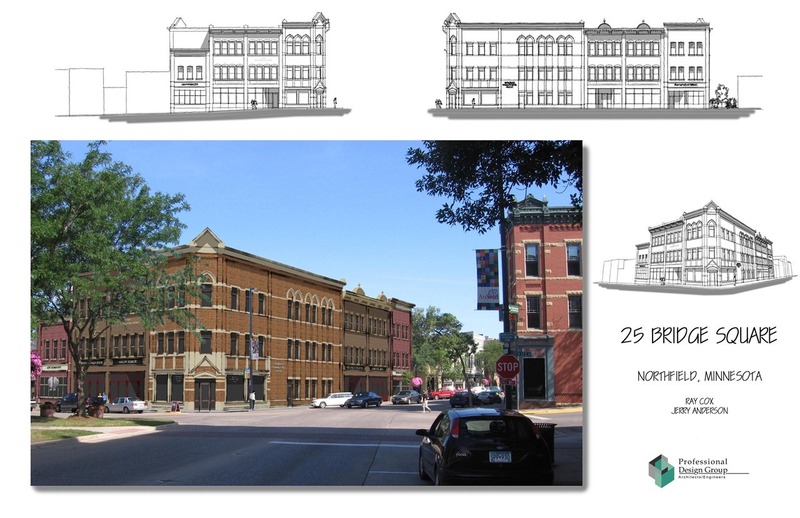 A few years ago, Northfield Developer and Business Owner, was quoted saying that 20-30 years ago we should have bull-dozed all the buildings along Division Street and built new historically correct buildings with proper foundations, access for handicapped and with fire sprinkler systems installed. Then we would have had a town center that worked and was competitive instead of the complex cost structure all downtown buildings are faced with. We could still do it. Sounds like a great idea, which would help preserve our town’s historical character for future generations to enjoy. Historic areas are interesting to deal with…as Hayes knows. Some areas have destinct time periods that the community is all working to maintain. An example of this is Tombstone, Arizona. They still keep board sidewalks and dirt streets in the main section of town. No signs adverstising ATM’s, no visible phones, no wires, etc. The entire town is clear about the date in time they are preserving. Some people may like the existing bank building as an element from 1965. I’m old enough to remember walking into the ‘old bank’ through the corner entrance and getting them to open my little savings bank with a special key. It was a grand old building and I believe that corner of Northfield was more enhanced by the big old brick structure than by the more modern concrete structure there now. The sky now comes much closer to Division Street than it should on this corner, when compared to the First National, Central Block, and Scriver Buildings. The Scriver building is an example of a ‘mixed decade’ building. It has lovely stone work from the 1870’s that the NHS has carefully….and expensively….maintained. It also has some brick and stucco elements on a 1930’s alley fill in that was also applied to the Scriver bulding itself. I wouldn’t particularly care to see the 1930’s work preserved. I’d much rather see the 1870’s work restored and the 1930’s alley fill in made somewhat ‘bland’ so that it doesn’t stand out at all. I say this because the 1870’s facade makes sense to Northfield. 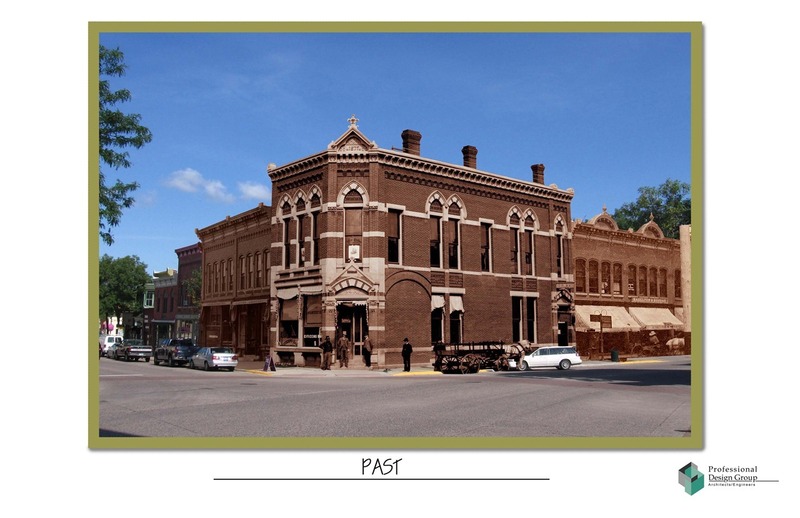 It relates to Jesse James, Hiram Scriver, the First National Bank original location, etc. etc. Each decade has some work, but I’m OK with preserving some of it with photographs. KYMN will be video streaming today’s Heritage Preservation Commission meeting at 4:30 pm (agenda and packet here). The mtg is all about 25 Bridge Square. 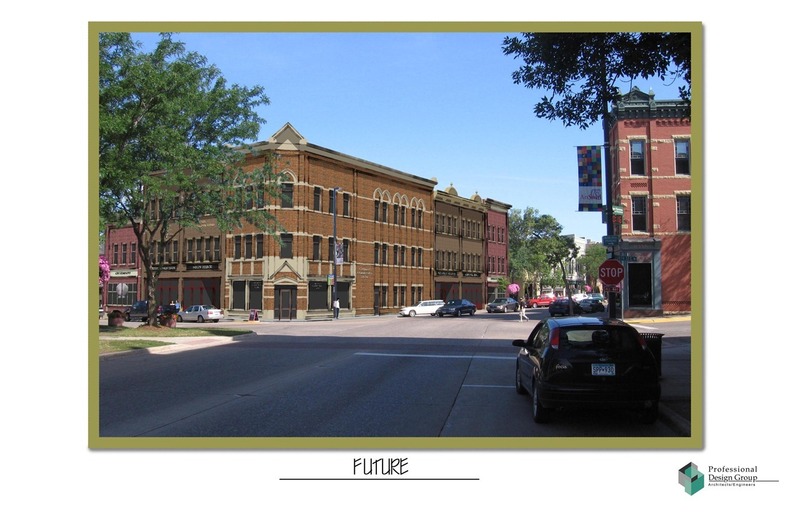 See Councilor Betsey Buckheit’s blog post: Excitement at the Heritage Preservation Commission Thursday. She addresses two important aspects to the project: financial incentives and parking. Would something other than neo-traditional work in Northfield’s historic district? Sure. The plans for Carleton’s Arts Union look intriguing and promising, if there’s ever enough money to build it. On the other hand, the new Carleton dorms, and the (now 30-year old or so) addition to the public library show that neo-traditional can be a good choice. Over at St. Olaf, the new science center, Regents Hall, seems to me a welcome relief from the prevailing gray Gothic and the Richardsonian (if that’s what it is) of Old Main. Neo-traditional is a safe choice. 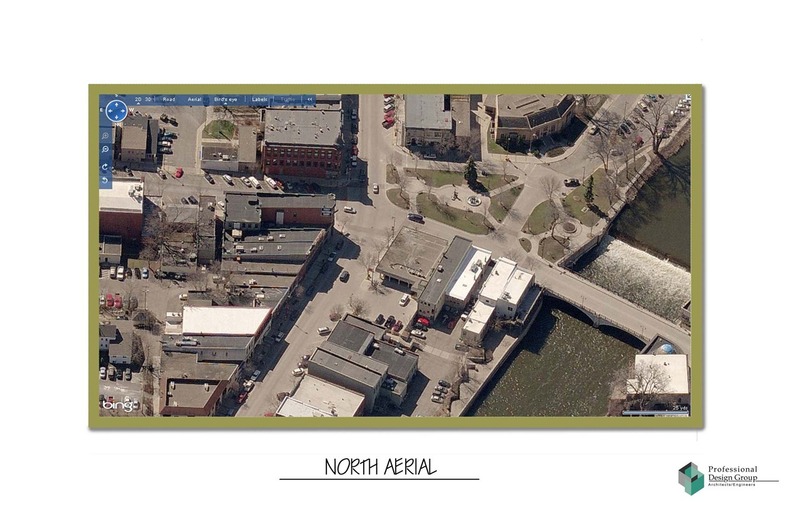 If you depart from the prevailing 1880s style, I think you’d want a talented architect to create something that, in another forty years, won’t look ridiculously dated and out-of-place like the current 25 Bridge Square. These guys should have been podcasting! Hmm, one of the pingbacks didn’t work. 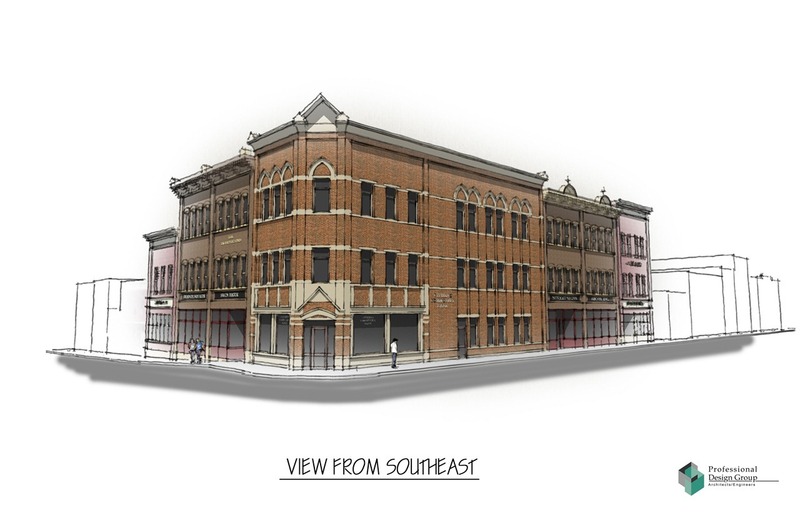 So if you’re wondering what Jim Haas and Rob Hardy are talking about, see my blog post from earlier today: Could something other than 1880s historic work for 25 Bridge Square? Scandinavian city centers have modern additions to their traditional buildings as well (Aalto in Helsinki / Snohetta in Oslo / Copenhagen)…Now, I am not saying these should be mimicked either, but rather lessons learned. Maybe the Arts Guild should sponsor a debate using historical architectural personalities: Ada Louise Huxtable versus I. M. Pei. Maybe Walter Gropius or Pierre L’Enfant versus some schlockmeister like John Portman. Etter could write the dialogue (aided by H. Scriven’s research). History, theatre, architecture, and current events all rolled into one! Hey! I.M. Pei’s not history, yet. The Maple Grove mall (pictured on your linked/locked post) looks like a perfect match for the new building proposal. If our main street wasn’t so funky and musty, we could be more like Maple Grove. They have easier parking, too. HPC passed a motion supporting demolition of the Aldsworth Building earlier this evening, 4-2. Maggie Lee, Peter Carlson, Cliff Clark and Sue deMalignon voted in favor. Mary Titus and Judy Swanson opposed. Chair Bob Will abstained, as it wasn’t a tie vote. Steve Edwins and Steve Wilmot, SMSQ architects, recused themselves. KYMN has the video of the meeting archived in this blog post. Scott, we don’t often agree on much, but your proposed headline, “Bridge Square Boondoggle Would Bail Out Local Developers” seems to be a nice summary of how this will no doubt now play out. Patrick, assuming you’re right about forthcoming requests for public dollars on this project, how would you compare it to the public dollars for the two business park-related annexations? Are those boondoggles, too? Perhaps. However, I would think that the most recent downtown building boondoggle might be a better comparison. Griff: What public dollars for annexation are you talking about? Patrick: That wasn’t a private request for public dollars. It is a public expense for the annexation. Patrick: Exactly. The benefit doesn’t inure to the landowners. David, you seem to have missed two points. First: As I said to Griff (well, alluded to anyway), the Crossing would seem to be a better point of reference for discussing public assistance for this proposed Anderson/Cox development. Second: You asked what public dollars were associated with the annexation. I provided an example of such. But that would seem to be a bit of a red herring here, and a better topic for the annexation thread. BTW, I’m not suggesting that we focus on discussing the specifics of the annexations or The Crossing here, but I think it does help to compare them for trying to assess what’s appropriate for 25BS. Griff: I think we have to start with the assumption that no public dollars are appropriate for any project – public or private, and then work from there. Otherwise, there is no systematic evaluative procedure for determining appropriate expenditures. Should we give public money to the 25 Bridge Square project? I don’t know. Let’s see the developer’s economic justification. Let’s not be swayed by some of the same emotions that got us into trouble with the Crossings – the desire to build a bobo paradise. I agree that the starting assumption for any private project should be that no public dollars are appropriate, and that it should be financed entirely with private money. If Ray Cox and Jerry Anderson can provide convincing evidence that 1) this project is sure to be an economic boon to the city, 2) that evidence can pass assessment by an expert neutral party, and 3) for some reason, their project truly cannot be funded solely with private money – then the city might be well-advised to give them financial assistance. My caveat here would be that non-forgivable loans, or a stake in the returns from the project, are a much better idea than free money. I don’t know what homework was done before throwing money at The Crossing, but it doesn’t look like the city very accurately assessed the risks and benefits with that one. It would be quite foolish to rush to approve public funding for this project in a similar manner. Patrick: One of the reasons, perhaps the primary reason, that the Crossings got public financing was that it had a utopian appeal. It is interesting that this project is being proposed by the two individuals on the Safety Center Task Force recommended a pragmatic, rather than a utopian approach to spending public money. Well, if the Anderson/Cox development truly is a pragmatic proposal, it should have no difficulty paying for itself. And, if the City wants to impose restrictions on their proposed development, it should be prepared to provide financial assistance. David, you’re not seriously suggesting the City needs to “buy” a right to set parameters for a development in its limits? Sean: The City can set parameters; but it comes at a cost. On the flip side, when the City offers incentives for projects that wouldn’t otherwise make it, we can end up with projects like the Crossing. I would appreciate it if people commenting on the 25 Bridge Square proposal would note and be aware of the distinction between a developer and a builder. 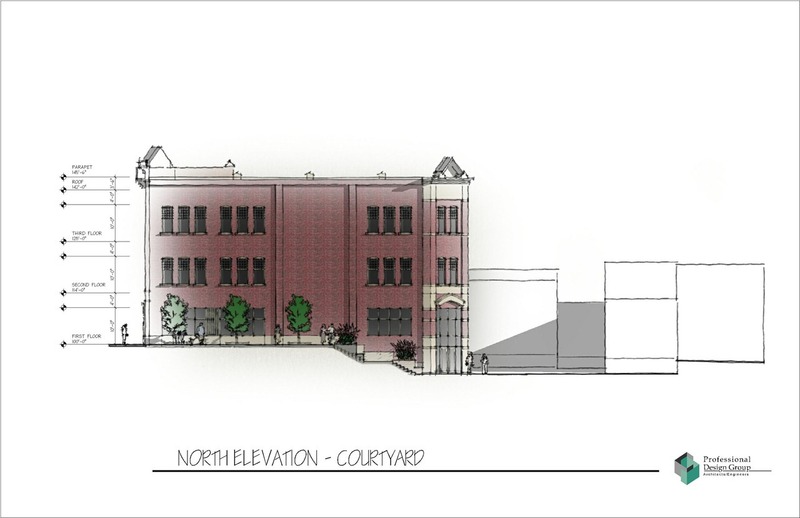 Northfield Construction Company has been asked by a developer, Jerry Anderson, to provide construction services for this project once it gets underway. As the owner of Northfield Construction I am participating only in this capacity…..as the builder of the project. I have done the same for hundreds of projects in town, such as First National Bank downtown, First National Bank-South, Dokmo Ford-Chrysler, Subway, AmericInn, Appeldoorn Dental, Laura Baker Services, Three Links Care Center and on and on. There is a huge difference between a developer and a builder. The developer is generally the ‘idea guy’. The builder is the ‘nuts and bolts guy’. Also, wasn’t there some controversy over Anderson during his brief tenure as mayor of Northfield back in the nineties? As I recall, he lived in some other town, perhaps Dundas, at some crucial point, but managed to get elected in Northfield anyway. I don’t believe the matter was ever settled, as he resigned for another reason. That doesn’t mean we can’t trust him now; I was just trying to remember what was up with that. If the city wants to spend 3 million on an office building, it’d be nice if we actually ended up owning it – much like all the other items that you mention. Scott: Until Jerry asks for money, why speculate? Perhaps before the City spends itself out of money (which it seems intent upon doing) it should work on a rubric for determining when and how it makes expenditures in public and private projects. Scott: Even if Jerry had a number, I don’t think the City has a clue how it would go about doing an evaulation of the merits of the expenditure. $270,000 is not too much for a short bike path; $500,000 is not too much for a parking lot; $8.5 million is not too much for an addition to the library. So, what would we will be willing to pay to help have a first class office building downtown? $3.0 million? It wouldn’t hurt to know what we would pay before Jerry does any asking. I’m not sure exactly what level of public assistance Jerry may ask the city to consider. I do know that this is a huge, costly project. 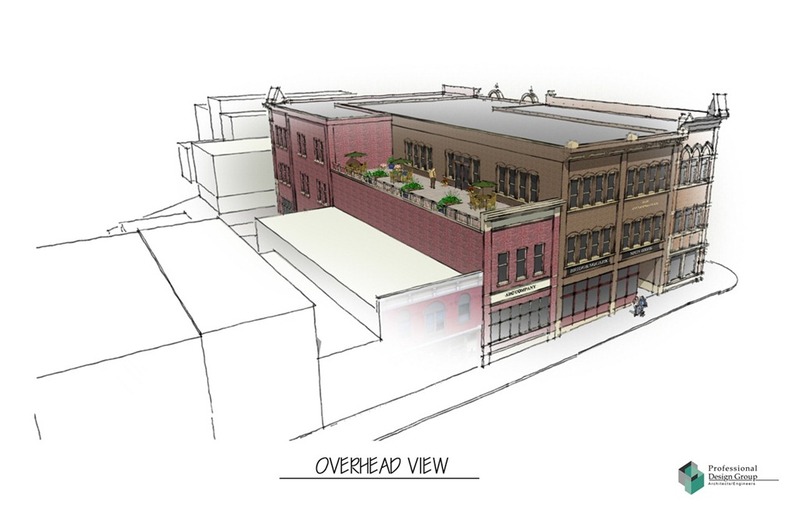 I also know what it will cost to demolish the two buildings on the site right now. Many times cities help out with redevelopment of sites like this. It is quite typical for a community to provide assistance clearing a site, dealing with rock excavation, bringing in new required utilities, etc. The benefit to the community is usually that the new tax base pays for the contribution to the project granted by the public….and then goes on paying for many more years. We have many examples of that in Northfield, such as the River Park Mall, where the pubic asssistance was paid off years ago and now the city has enjoyed the tax base generated for general needs. Another reason the city may be interested in assisting in some way to make the project happen is that several local businesses are considering relocating to this building. Without a Class A building like this some of the businesses may not remain in Northfield, or would relocate to the edges of town. Scott, I’m aware of the issues you noted about Jerry. But I am not aware of any proven issue at all. I also believe all issues related to his residency were examined in a fair and open manner and he was seated as Mayor. Jerry has been nothing but honest and truthful in dealing with me on the project, and that is how I believe he has dealt with the various city boards and staff. There isn’t much to be dishonest about in the project as it a pretty straightforward building….just an expensive one. Ray: You might want to get together with Jerry soon and talk dollars and cents. It seems like he should have clued you in by now.